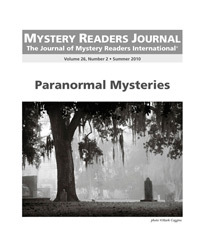 There has always been a link between the genre of mystery or crime fiction and the supernatural. While not a major factor in most stories, a surprising number of authors—past and present—involve the uncanny, paranormal world and related phenomena. In its most basic form, the “Locked Room” mystery is a prime example—a murder is committed, a corpse is found in circumstances which imply that the killer could not possibly be in the same room as the victim and yet… there is the body! Now, readers are understood to follow the line of thought thus: Victim is dead, Method is undiscoverable, Sleuth will reveal cleverness in finding Killer! At no point is the reader expected—nay, or even desired—to think that the victim died by a ghostly hand. The Locked Room mystery genre is a skilled craft in which only the talented are praised, for coming up with ingenuity! However, the stonefast rule of this art is… the supernatural need not apply! But, aside from the Impossible Killing, what of the more intended links in the mystery story and the world outside normality? How common is it? The doyenne of mystery writing, Agatha Christie, used the paranormal world quite often. More often than many realised. There was the use of the séance to frighten a confession out of the killer—The Tragedy at Marsden Manor and Peril At End House are classic examples. One wonders how Poirot would have fared if the killer was not susceptible to the fear of vengeful spirits. Apart from a spoken confession (usually unrecorded and deniable), what hard evidence was there? Christie also used the séance as part of the crime, in The Sittaford Mystery. A sitting predicts murder, when the crime couldn’t have been committed. But this was a one-off plot device, ingenious as usual; the reader would tumble to it if it had been used again (unlike some of her methods). Margery Allingham’s Campion series often had a supernatural flavour to the stories, if not direct allusion to the paranormal. Our Albert was intrigued by cases involving curses, legends and long-lost mysteries, vide Look to The Lady and The China Governess. More directly, Gladys Mitchell had her wizened old psychologist-sleuth Mrs Adela Bradley investigate a haunted house in When Once I Died; in fact, she looks into the past death of a ghost hunter at a haunted house, based on the Borley Rectory case. In this direct challenge to the supernatural, Mrs Bradley obviously deconstructs the poltergeist of the house. More recently, the late Bruce Alexander had the famous “Blind Beak,” Sir John Fielding, come into contact with a family ghost in Smuggler’s Moon. Of course, one entity is explained as a purely mundane situation… but what of the other, unaccounted spirit witnessed? So what is it about the supernatural, the paranormal world which appeals to both reader and writer alike? Firstly (as we’ve seen) the supernatural event can be used both to cover up a crime or to uncover it. In the former, if a crime is disguised as a haunting then few people would either like to look for the mundane explanation or even understand the event itself, like a murder committed in full public view which—on the face of it—is spontaneous human combustion. The curse is a fantastic device here; how many crimes can be committed which would be dismissed as part of the curse? In the latter factor, the belief in the supernatural can be used to force the superstitious—already guilt-ridden—to unburden their souls, in a séance for instance. Secondly, the mystery-supernatural cross-over fits because the paranormal world is, obviously, a mystery itself. Like watching an illusionist, we don’t believe in the witnessed event —we know there is a trick to it and want to figure it out. We expect a good crime writer to explain the inexplicable, whether the murder in a sealed chamber, or the public prediction of a crime by someone who couldn’t possibly have pre-knowledge or the opportunity to commit it. In effect, since we read a crime writer to solve a crime, we expect the same to be done to the well-known mystery of the supernatural. If a crime writer were to write a story where the unexplained to remain the solution to a case then they’d be drummed out of the service! It is just about acceptable for the main mystery to be solved as a mundane crime yet leave a little loose end in a red herring or secondary plot-device. As long as the crime writer proves the crime to have a distinctly earthbound solution then we are happy to read it; the magician’s “trick” is explained. I would like to point out that there are plenty of stories which have a ghostly set-up, accepted by all, yet the mundane solution is presented; for instance, Paul Doherty in his The Sorrowful Mysteries of Brother Athelstan uses this as the basis. The marked difference of these stories is the time period in which they are set—the Middle Ages. It is in this historical period that religion holds an iron grip on understanding of nature yet, curiously, encourages the complete acceptance of the paranormal. In fact, any story set in a past time where the supernatural—of divine sources or not—can get away with the introduction of the paranormal yet are, ultimately proved to be normal to natives of the time. Here, readers fully expect to find a mundane solution… and never fail to get one! The great writer Charles Fort gave inspiration for the term Fortean; this is the subject, incident, phenomena or happening that, while inexplicable, remains widely accepted. From ghosts, UFOs and Yeti to unsolved disappearances, uncanny coincidences and inexplicable human behaviour, Charles Fort wanted to catalogue them. Now, crime (some crime, anyway) could be considered Fortean. How many times has either the crime or even the motive for a crime been called “inexplicable”? Fundamentally, there is a low-key yet definite link between the inexplicable (or—possibly—supernatural) crime and the writing of its stories. And it is this very link which underlies crime writing that draws readers, and writers, to the Fortean or supernatural subjects. Not to mention more direct links such as Arthur Conan Doyle’s profound belief in the Other World, faeries and such. When not reading historical crime fiction, Alan Bishop edits his website www.criminal-history.co.uk, writes reviews and is in the process of producing his own first novel. He has to take time off from this for his ordinary day job. He lives in Nottingham, UK, and is a regular in the oldest pub in the country. I hope ghosts are real. I think that’s why I have written so many ghost stories. If ghosts are real then that means life goes on after death and we all get to hang around town a little longer and maybe catch a movie now and then, maybe grab a slice of pizza, because the thought of hanging out in the bright white light listening to angelic choirs doing Gregorian chants seems like it might be interesting for a couple hours, maybe even a week, but an eternity? I’m not sure digression is allowed in the after life. Too many Gregorian chant rehearsals to attend. I write ghost stories because I don’t want this glorious story of life to end, in particular, my own life. Hey, it’s been a fun ride. Met some interesting people. You get to fall in love, eat food, drink wine. Ambrosia for eternity? Shredded coconut, walnuts, pineapple chunks, a can of fruit cocktail, marshmallows, and maraschino cherries all mixed up with nutmeg and cinnamon is not my idea of haute cuisine. I’d rather have the Mahi Mahi special. That said, I have never seen a ghost, except the older Boy Scouts who used to paint their faces with green glow-in-the-dark paint and come spook us in our tents after we’d all been sitting around the campfire listening to the story of Von Doon, this creepy guy who ended up drowning in a vat of radioactive waste while he was cooking up some sort of mad science project and now roams these very woods we’re camping in as a glow-stick type ghost, the kind that only exist in Boy Scout campfire tales. I think I once saw the ghost of Willow, our cat who used to like to hang out in a sunny spot in our living room, perched on the top edge of the sofa. One day, months after she “crossed over Jordan,” or whatever river cats cross over (probably the Nile, given that whole Egyptian-cat connection), I swear I saw Willow in her old familiar pose. Until I looked back and she was gone. For the record, Willow did not glow in the dark. Many of the kids I talk to in Middle Schools, when I do author visits for my “Haunted Mystery” series, swear they have seen ghosts. They have very specific anecdotes to relate. The one in the room at their grandmother’s house. The other one who hangs out in the boys’ bathroom at school. Hearing their tales, I am reminded that once, I kid you not, I saw a six-foot-long ant crawling along the wall inside our garage in Buffalo, New York, where I lived at the time. Maybe it was a renegade mutant from the nearby toxic Love Canal. Maybe my mom was putting something extra in the Kool-Aid. Whatever. I never told anyone about the ant, or the scary devil I saw rise up out of an oil splotch on the floor of that very same garage some weeks later. That one I blame on the fact that, at the time, I was attending Catholic Catechism School. Do children see more ghosts than adults because they are closer to that side of life, having only recently departed that other world to come into this one? Or do they just like spooky stories. Interestingly, a few adults have asked me if I think The Crossroads, The Hanging Hill, and The Smoky Corridor are too scary for children. No child has ever said they were. They love staying up late at night with a flashlight under the covers and gobbling up my thrills and chills. Yeah. I heard it. It was someone banging their head on an overhead pipe because they forgot to turn on the lights down in the dungeon. I always enjoy hearing the historical ghost stories at the top of these shows, like the legend about the woman who was bricked up alive behind a castle wall during the middle gages and now haunts the catacombs. That would be a good reason to hang around and haunt the folks who “Cask of Amontillado”-ed you. On the other hand, I hate the crew of intrepid Ghost Hunters with their ghost probing paraphernalia. Dan Aykroyd and Bill Murray’s had cooler equipment and did a better job of exorcising the evil spirits than those dudes in the vans on basic cable. I want ghosts to exist, as I said, so I know death is not the end. However, having watched the last episode of “Lost,” I’m a little afraid of who might show up for “the concert” in the Unitarian chapel when it’s my turn to wait for the light. Who decides what was “the most important part of my life” and gets to cast my gang of fellow travelers? What if they decide it was that summer I sold hot dogs at a greasy spoon in downtown Knoxville, Tennessee? Or when I was a struggling actor and had a day job at Citibank helping rewrite “The Country Risk Assessment Manual?” I mean the people who survived the island on Lost may have gone on to do great things. Maybe they didn’t want to hang around waiting for Jack and Hurley when they passed over. Maybe they’d rather be remembering an Oceanic Airlines celebrity pro-am golf tournament they won or something. When I was researching the first book I ever wrote (it was called The Prayer Circle and has never been published), I read a lot about near-death experiences and what awaits us on the other side of the bright white light. Typically, your ancestors greet you first. I’m not so sure about this being a good thing. The one grandfather I actually knew was kind of a creepy old Greek guy who sat slumped in his chair when we visited him in Florida every summer. He mumbled in Greek, never put in his teeth, and kind of smelled like mothballs. Then again, he was ninety, I was six, and accustomed to seeing giant ants crawling around in the garage with Satan. My Greek grandmother, who was about twenty years younger than her husband (I think it was one of those Old World arranged marriages that awaited you once you made it past Ellis Island) was fun. At the end of those summer trips to Florida, she would always give us a bag full of pencils she had collected all year long plus an envelope stuffed with five bucks if we promised we’d keep getting good grades when we went back to school in the fall. Her I wouldn’t mind seeing in the tunnel. And, yes, all these years later, I have still never, ever voted for a Republican. I do not have to fear neck wringing in the afterlife. Actually, I wish my Yiya were a ghost and would come by and give me more long-lasting words of advice like that again. It has made Election Day very easy for close to forty years. If I were a ghost, the first thing I would do is go to my own funeral. See who was there. See what people thought about my will and what I left them. But then, if I stuck around, I’d probably realize that life went on with or without me. And there I’d be, rattling chains, moaning and groaning, giving people goosebumps, having absolutely no effect on anything, except to make a few people scream or wet their pants. Not a very productive existence. I guess this is why Willow the cat never came back to our couch after that one visit, why ghosts, if they do exist, eventually move on. And that’s truly why I hope ghosts are real. It means we all have some new experience to move on to after we’ve put in our time “doomed for a certain term to walk the night,” to quote the ghost of Hamlet’s father. Yes, Shakespeare believed in ghosts. I wonder if his own ghost stuck around long enough to see any really awful productions of his work. Probably just one. And then he moved on. I wonder if Shakespeare still gets to write and make up stories where he is. I wonder they need more writers in that place we eventually move on to? If so, I hope, when I meet my Greek grandmother in the bright white light, she brings me some more pencils. Chris Grabenstein is the Anthony and Agatha award winning author of the Haunted Mystery series of middle grades ghost stories for Random House Children’s Books: The Crossroads, The Hanging Hill, and The Smoky Corridor. “You write ‘whatdunits’,” my friend, author J.D. Rhoades, said to me. I can’t tell you what a relief it was to hear that. My books have been called supernatural thrillers, horror, paranormal mysteries, paranormal thrillers, mystery/thrillers, suspense, dark suspense, and every combination of the above you can think of. Librarians and booksellers tear their hair out trying to shelve me. But “whatdunit” is the best way I’ve ever heard to describe the blend of genres that I strive for in my books. I grew up reading anything with a spooky cover: Ira Levin, Alfred Hitchcock anthologies, Richard Matheson, Daphne DuMaurier, Sheridan LeFanu, the Brontes, Poe, Stephen King, Anne Rice, Ray Bradbury, Agatha Christie. Anything gothic, anything ghostly, anything mysterious, the occasional fantasy—it was all there in my father’s extremely eclectic collection. But my favorite books were the ones in which for a long time—or for the entire book and beyond—you weren’t really sure if there was something supernatural going on, or if it was just psychological, or maybe even an elaborate con by human villains. Every mystery is a guessing game, but I loved having that extra-dimensional element, even if it turned out to be a red herring. I thought it was thrilling how Rebecca haunted Maxim and the second Mrs. deWinter in Daphne DuMaurier’s Rebecca; she was as real as a ghost even if no diaphanous figure ever appeared. It creeped me out that it seemed to be emotionally troubled Eleanor who was activating the ghosts of the old mansion—or was she staging the manifestations herself?—in Shirley Jackson’s The Haunting of Hill House. And that ghost/postpartum depression/feminist rage personified in Charlotte Perkins Gilman’s The Yellow Wallpaper—yike. I was never one for the overtly supernatural, though. I preferred eerie and ambiguous, the way I figure most people experience hauntings in real life: as a moment out of the ordinary that feels like something more, but there’s no real evidence of it. In fact, my strong feeling about the paranormal is that it’s always a combination of the psychological and the supernatural, with a dose of human expectation and often human manipulation thrown in, and it’s a true mystery to try to unravel what the hell is going on (sometimes literally!). And as the daughter of scientist parents, I am pretty good at channeling my inner skeptic—even if I do say so myself. So in my writing, I love to mix the intellectual pleasure of solving a mystery: following clues, evaluating canny suspects, uncovering a twisted history—with the very sensual thrill of unknown forces reaching through the veil to touch the human participants. But I always want to believe something really could have happened, even if it’s never happened to me. So I figure my job as an author is to create a situation so close to how a haunting, or poltergeist manifestation, or possession, would actually happen in real life that a reader experiences it as real. To that end, I am constantly doing research into paranormal occurrences as they are reported by real people in real life, and constantly interviewing people about their own experiences. I look for the consistent elements in people’s stories and that shivery feeling of truth, the shivery feeling I want to elicit in my readers. And I always, always ground every story in reality. In my first book, The Harrowing (St. Martin’s, 2006) I used my own real-life brush with a poltergeist as the basis of a college haunting. In high school I was the kind of Goth girl who was always doing things like playing around with séances in cemeteries (because it’s not enough just to have a séance or to spend the night in a cemetery, oh, no—you have to have the entire multidimensional experience all at once!) and one night I and a group of friends were doing something like that with a Ouija board, and we were talking to a—whatever—that called itself Zachary, the not-so-nice spirit that the students conjure in The Harrowing. The dialogue was scary, disturbing, and at a particularly tense point of the séance a glass candlestick holder suddenly shattered in front of us. I never believed there was an actual entity present, but it did make me consider that poltergeist researchers might be right, that the hyped-up hormonal energy of teenagers can sometimes cause random movements or breakages of objects. So—years later—it was that kind of ambiguous haunting I created for the book. In The Price (St. Martin’s, 2008), I wanted to explore the idea of a deal with the devil, again from a very psychological perspective—my premise being that it’s the secret bargains we make with ourselves in our times of greatest stress that can get us in just as much trouble as if there were a real devil involved. So I took a good man (and several other good people) in the most stressful situation imaginable (witnessing the slow death by cancer of his only child and the mental unraveling of his grief-stricken wife), and had a mysterious stranger present him with an opportunity—that may be just a stress-induced hallucination. The book is set in a real hospital complex in Boston, which is really six hospitals which have grown into each other, shooting out glass bridges and underground tunnels and walkways like some alien parasite. You can walk in this place for miles and miles, passing through different hospitals, without ever getting to the outside. A hospital is an altered state to begin with, but this is truly one of the most trippy places I have ever been, the perfect setting for my reality-bending story. In The Unseen (St. Martin’s, 2009), I actually mixed a lot of history with my fictional poltergeist investigation; the book is based on the real-life Rhine ESP experiments and poltergeist investigations that took place at the Duke University parapsychology lab from the 1920s to the 1960s. The haunted mansion in that book is also a real place, a Southern mansion of the kind they called “Yankee Playtime Plantations”, which was a party house for Roaring Twenties literati like Scott and Zelda Fitzgerald, Thomas Wolfe, Max Perkins and James Boyd. The mansion is reputedly very haunted and I was able to spend a couple of weeks there, soaking up atmosphere and yes, some creepy experiences. In my new whatdunit, Book of Shadows (St. Martin’s, June 2010), I got to explore my longtime fascination with and research into the modern practice of witchcraft: a very male, very rational (he thinks!) Boston homicide detective catches a case that looks like a Satanic killing, and reluctantly must team up with an irrational, very female, and completely untrustworthy witch from Salem who insists that there are previous murders and more to come and that the killer is trying to summon a real demon. I think this book might walk my finest line yet between reality, mystery, and the supernatural. And of course Boston and Salem are two very haunted places—layers of history, including the witch trials in the general area. Thriller award winner Alexandra Sokoloff‘s paranormal mysteries have also been nominated for Anthony, Bram Stoker and Black Quill awards. Alex is a produced screenwriter and teaches a popular Screenwriting Tricks for Authors workshop, based on her workbook and blog. Shifters is coming November 2010.